The MFM ( Modified Frequency Modulation ) procedure was introduced within the patent number 4,376,958 . More details concerning the MFM can be obtained from several sites in the Internet . The MFM procedure was used predominantly at hard disks and diskette drives with the ST506 interface. The transfer rate at the RL02 disk drives is based on 4.1 magabits/sec and therefore very difficultly to clone it with the 50 MHz FPGA Clock . ( 5.0 MHz would be essential and therefore easy to realize at the ST506 interface ). But there are approaches to solution which I want to introduce in following 3 chapters. 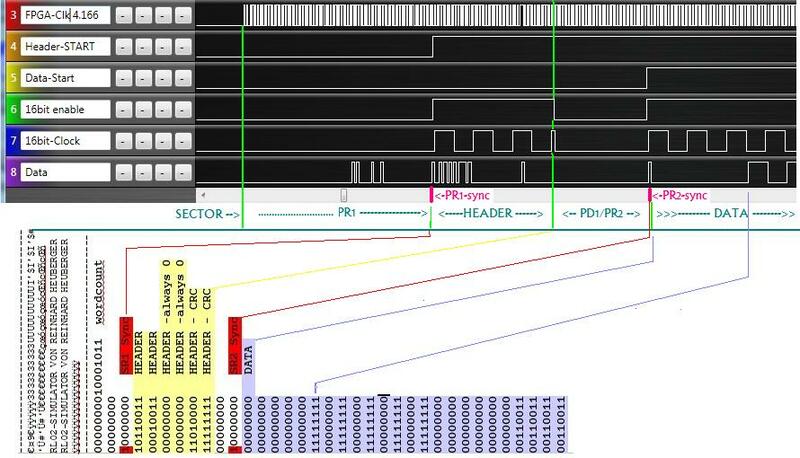 B) Realization of a MFM DECODER with CLOCK and DATA RECOVERY (CDR) by measure the MFM signals. C) Ready for use MFM DECODER with CLOCK and DATA RECOVERY for DEC RL02 disk drives based on SHIFT REGISTER technology with Clock-Sync. The RL02 cartridges were factory formated and the Servo/Header format was strictly company confidential to force purchasing the expensive, original DEC cartridges only. In the Servo/Header section of the RL02 disk cartridge format appears sometimes a 0.125uS or 0.625uS MFM signal ( 0.250uS, 0.325uS, 0.500uS is normal ) which will confuse my MFM decoders, described in chapter B) and C) Original, the Servo/Header decoding was realized with a ROM on the RLV-11 controller. To eliminate this undocumented feature in the design chapter C) , the Servo/header part will be skipped and a re-sync with byte alignment in the Data preample (PR2) phase which contains 47 "0" following by a marker "1" (Sync Bit) is my way to bypass it at this point in time. Unless the structure of the Servo/Header information ist not 100% clear, the MFM clock will be disabled for 250uS. Understanding the Servo/Header structure will become very important by designing the MFM Encoder and is an ongoing issue for me. From the present view it would have been much simpler to develop a disk simulator based on the ST506 interface . To be able to analyse the MFM signals, a test-pattern which always provides the same contents per sector and track was necessary. I did generate this required test-pattern with a RT-11 Basic program . This was the ideal starting point for an exactly analysis of the MFM signals. The MFM-data got visible on a logic-analyser very well. The necessary MFM-decoder for this task was relatively easy to develop because the required synchronous 4.1 Mhz MFM-clock is available during a write cycle and is distributed from the RLV-12 controller. The circuit-diagram looks correspondingly simple. At this point, we are already able to decode MFM data, but this method only works if a synchronous clock signal within the MFM signals is available. The second disadvantage of this methode: I have to rebuilt manually all the timing-track/servo/header infos including CRC during the MFM-encoding cycle. Therefore we need a MFM decoder with CLOCK and DATA RECOVERY ( CDR ) to collect all the timing infos from the surface. B) Realisierung eines MFM DECODER mit CLOCK and DATA RECOVERY ( CDR ), Messen der MFM Signale. To reconstruct the clock signal from the MFM data, a PLL is needed which was typically included on the RLV-11/12 disk controllers. There is no PLL in the FPGA world based on the classical form with VCO, though. 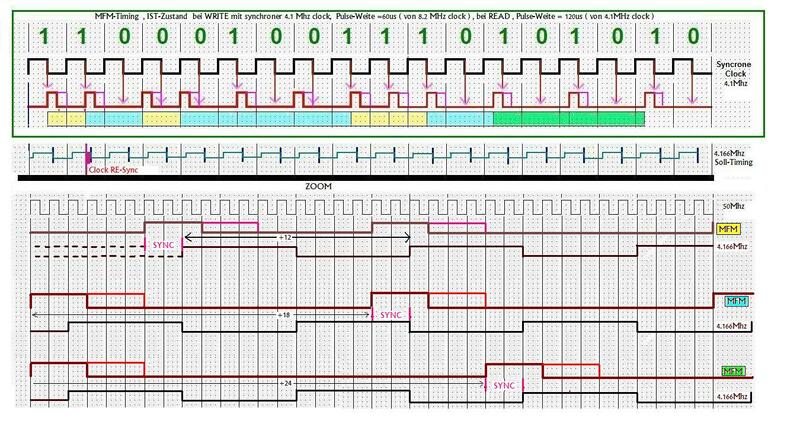 Instead of the PLL , the DPLL algorithm is used to reconstruct the clock signal from the MFM data. To generate an output signal whose phase is related to the phase of the MFM signal, a considerably higher frequency is necessary to be able to measure the time periods between the MFM signal edges. In the example here with a standard 50Mhz FPGA clock. The 3 different MFM signal periods produce a counter resolution for 12 = short period, 18 = long period and 24 very long period. At the first moment, the algorithm seems to be a little unclear. It lies well, that no clock is provided for the first “0“ if a double “00“ sequenze occurs within the MFM method, so it virtually falls away which saves disk space. Furthermore is valid, that a long MFM period always result in a Bit change. There also is a particularly interesting constellation at a bit sequence “100100100100...“ which has a Long cycle loop the consequence. Implementation: I have developed the complete MFM-Decoder Program in GFA-Basic/Pascal because nothing quicker gives development and testing of an algorithm for me. Status: This effective and elegant solution is not completed yet. I want to implement the algorithm with Verilog and to do this, at present, I still have too little experience. If it is done, I will publish the code. 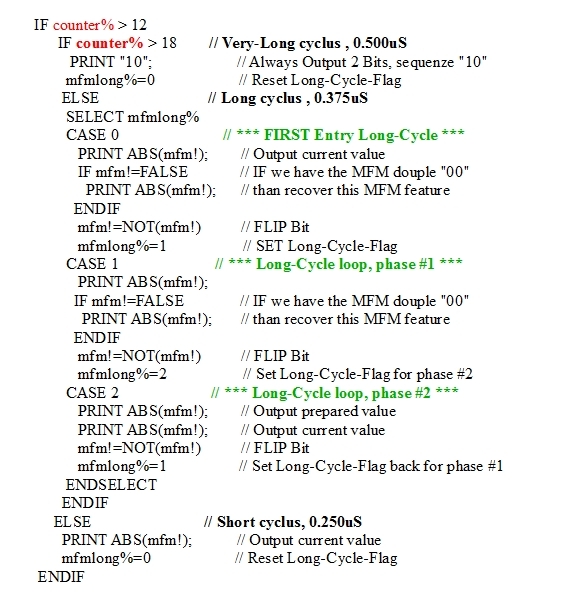 At present, I am able to collect the MFM cycles via a counter running with the 50Mhz FPGA clock, send the data to the ARM or NIOSII CPU and decode it. Also here, I still run in the problem already described in the servo/header area of the MFM data (see note in overview). - Basic circuit to be able to read one sector and/or track. All files are available in JPG format. For Altera/Quartus user, I can provide the entire folder, including programes for the ARM CPU in the ZIP format. If required , please send me an e-mail.